Are psychedelics good for you? It's such a hippie relic of a question that it's almost embarrassing to ask. 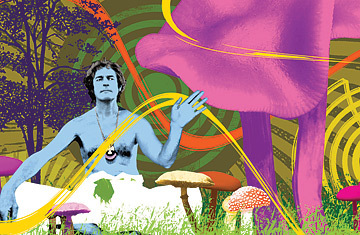 But a quiet psychedelic renaissance is beginning at the highest levels of American science, including the National Institute of Mental Health (NIMH) and Harvard, which is conducting what is thought to be its first research into therapeutic uses of psychedelics (in this case, Ecstasy) since the university fired Timothy Leary in 1963. But should we be prying open the doors of perception again? Wasn't the whole thing a disaster the first time? The answer to both questions is yes. The study of psychedelics in the '50s and '60s eventually devolved into the drug free-for-all of the '70s. But the new research is careful and promising. Last year two top journals, the Archives of General Psychiatry and the Journal of Clinical Psychiatry, published papers showing clear benefits from the use of psychedelics to treat mental illness. Both were small studies, just 27 subjects total. But the Archives paper--whose lead author, Dr. Carlos Zarate Jr., is chief of the Mood and Anxiety Disorders Research Unit at NIMH--found "robust and rapid antidepressant effects" that remained for a week after depressed subjects were given ketamine (colloquial name: Special K or usually just k). In the other study, a team led by Dr. Francisco Moreno of the University of Arizona gave psilocybin (the merrymaking chemical in psychedelic mushrooms) to obsessive-compulsive-disorder patients, most of whom later showed "acute reductions in core OCD symptoms." Now researchers at Harvard are studying how Ecstasy might help alleviate anxiety disorders, and the Beckley Foundation, a British trust, has received approval to begin what will be the first human studies with LSD since the 1970s. Psychedelics chemically alter the way your brain takes in information and may cause you to lose control of typical thought patterns. The theory motivating the recent research is that if your thoughts are depressed or obsessive, the drugs may reveal a path through them. For Leary and his circle--which influenced millions of Americans to experiment with drugs--psychedelics' seemingly boundless possibilities led to terrible recklessness. There's a jaw-dropping passage in last year's authoritative Leary biography by Robert Greenfield in which Leary and two friends ingest an astonishing 31 psilocybin pills in Leary's kitchen while his 13-year-old daughter has a pajama party upstairs. Stupefied, one of the friends climbs into the girl's bed and has to be pulled from the room. A half-century later, scientists hope to unstitch psychedelic research from their forebears' excesses. Even as the Clinical Psychiatry paper trumpets psilocybin's potential for "powerful insights," it also urges caution. The paper suggests psilocybin only for severe OCD patients who have failed standard therapies and, as a last resort, may face brain surgery. Similarly, subjects can't take part in the Ecstasy trials unless their illness has continued after ordinary treatment. Antidrug warriors may argue that the research will lend the drugs an aura of respectability, prompting a new round of recreational use. That's possible, but today we have no priestly Leary figure spewing vertiginous pro-drug proclamations. Instead we have a Leary for a less naive age: Richard Doblin. Also a Harvard guy--his Ph.D. is in public policy--Doblin founded the Multidisciplinary Association for Psychedelic Studies (MAPS) in 1986 to help scientists get funding and approval to study the drugs. (Doblin, 53, says he was too shy for the '60s, but he was inspired by the work of psychologist Stanislav Grof, who authored a 1975 book about promising LSD research--research that ended with antidrug crackdowns.) Doblin has painstakingly worked with intensely skeptical federal authorities to win necessary permissions. MAPS helped launch all four of the current Ecstasy studies, a process that took two decades. It's the antithesis of Leary's approach. All drugs have benefits and risks, but in psychedelics we have been tempted to see only one or the other. Not anymore.